This hearty and healthy stew gets added zing from a dash of chili powder, but the recipe’s real all-star ingredient is a humble legume: lentils! 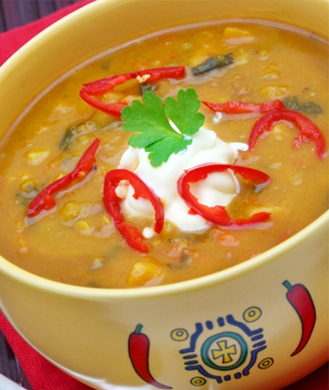 The fiber-rich lentil is low in fat and helps keep the calorie count down (191 calories per serving). Generously spray a large pot or Dutch Oven with olive oil spray or use a teaspoon of olive oil. Heat over medium-high heat. Saute the onion and garlic until lightly golden, about 2 or 3 minutes. Add the rest of the ingredients and bring to a boil. Cover and simmer on low until the lentils and vegetables are tender, around 20-25 minutes. Serve chili in bowls and garnish the top of each one with a tbsp. of sour cream. We recommend serving this chili with your favorite steamed vegetables. Cozy up to this warm mushroom and barley soup, which calls for only a handful of easy-to-find ingredients. 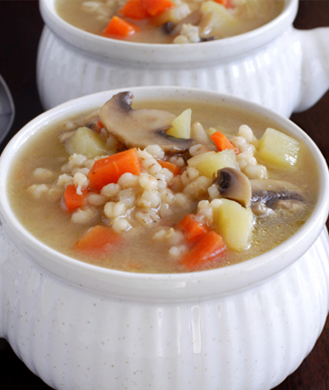 Nutty grains of barley give the soup a chewy texture, and plenty of veggies ensure this remains a satisfying low-cal treat. 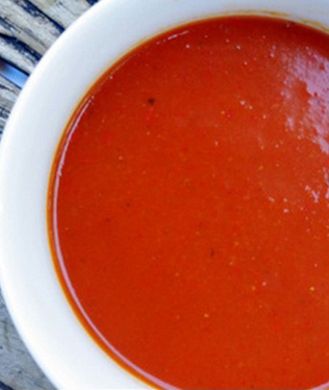 Crunchy, sweet bell peppers and crisp yellow onions are liquefied into a brilliantly colored puree. Teeming with antioxidants and clocking in at only 60 calories per serving, this tasty concoction is truly healthy comfort food. Make it a complete meal with a side of whole grains and mixed greens. In a pot, saute sliced onions and chopped garlic until soft. Add vegetable stock and roasted bell peppers. Bring to a boil, then reduce to a simmer. Season soup with salt and pepper. Fill a blender half full, and blend until smooth. Repeat blending until all soup is blended. Reheat soup and serve hot. 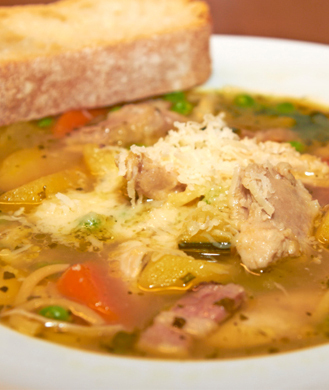 Hefty chunks of potato, chicken breast, and zucchini round out this stew perfect for a cold winter’s day. The medley of veggies, plus a sprinkle of nutmeg, guarantees this soup is as filling as it is flavorful. Place all ingredients into a crock pot, layering potatoes first, then chicken, followed by zucchini and onions last. Pour in low sodium chicken broth, and sprinkle nutmeg on top. Cover and cook for 8-10 hours on low heat. After cooking, shred chicken with a fork. When ready to serve, add a tablespoon of unsweetened Greek yogurt to each bowl and enjoy. 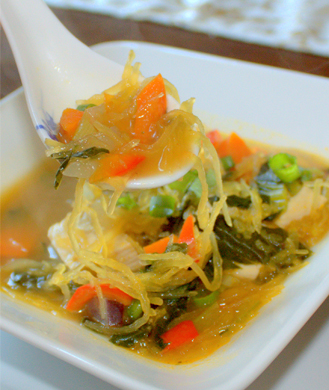 This simple soup recipe is much better for you than a canned version, and it’s a snap to prepare. Four easy steps—chop, roast, simmer, and blend—gives you a silky tomato melange traced with the sweetness of onions and red peppers. Preheat oven to 400 degrees. Slice tomatoes in half and remove all seeds. Slice and roughly chop the red peppers into large pieces. Quarter the onion. Place all the vegetables, keeping tomatoes cut side up, on a baking sheet. Drizzle everything with olive oil and cover with fresh thyme sprigs. Roast in a 400 degree oven for 30 minutes. A few minutes before the vegetables finish in the oven, bring a large pot to medium heat. Once the vegetables finish, add the can of tomato paste and the roasted vegetables. Remove the thyme from the sprigs. Add it to the pot along with the minced garlic. Add the vegetable broth and bring to a boil. Then, reduce to a simmer for 30 minutes. Once the soup has simmered for thirty minutes, remove from the heat and use an immersion blender to blend to an even, smooth consistency. If you do not have an immersion blender, ladle the soup 2-3 c. at a time into a blender. Blend until smooth and repeat as necessary. 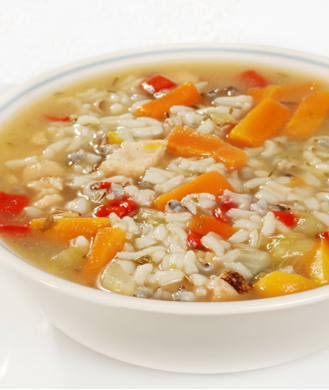 Turkey and brown rice immersed in soothing chicken broth is a quick way to make use of leftovers. Using frozen mixed veggies and canned low-sodium soup cuts down on prep time but still results in a mouthwatering, robust gumbo. Strips of spaghetti squash masquerade as faux noodles in this wonderfully low-carb creation packed with other earthy veggies like onions and purple potatoes. 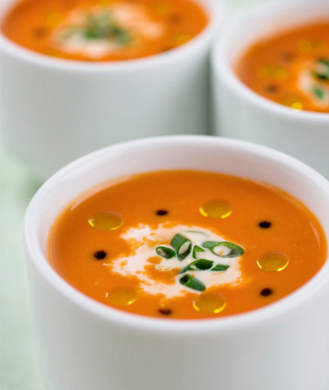 Sriracha hot sauce and toasted sesame seed oil infuse this wholesome soup with a slightly spicy, Asian-inspired flavor. Cook spaghetti squash: slice length wise, remove seeds, place in a baking pan face down, add water (about an inch high), bake for 30 minutes in a 400 degree oven. Prepare your veggies. Heat up a large pot and pour in your olive oil. Add onions and garlic. Saute for a couple of minutes. Add carrots, bell pepper, potatoes, and ginger. Saute for 5 minutes. Add vegetable broth, miso cup soup mix (optional), and tofu. Cook together for about 20-25 minutes. Then add toasted sesame seed oil, green onions, bok choy, and spaghetti squash noodles (removed with a fork). Add liquid aminos (for salt) and pepper (adjust to your liking). Add desired amount of Sriracha. Cook together for another 5-10 minutes. Piquant spices like curry powder and ground nutmeg add kick to this hearty brew. 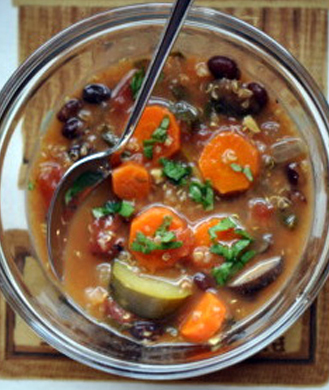 Thanks to tons of nutrient-loaded vegetables and protein-rich beans, the soup’s thick, chunky texture is satisfying and healthy at the same time. If you’re feeling experimental, swap out the veggies for your favorites or substitute brown rice or farro for quinoa. Heat the oil in a large soup pot. Add the chopped sweet onion and saute over medium-low heat until clear and soft. Add the chopped carrots, mushrooms, chopped zucchini, and minced garlic, and continue to saute for about 5-7 minutes. Place your bouillon cube into a medium sized bowl. Boil 6 c. water and pour over the bouillon cube. Stir well to dissolve. Add bouillon mixture, tomatoes, quinoa, black beans, chickpeas, veggies, and spices. Bring to a boil and then simmer gently for 15-20 minutes. Add the chopped spinach, stir well, and cover. Simmer on low for about 15-35 minutes. Taste and add more salt, pepper, seasoning, as needed. 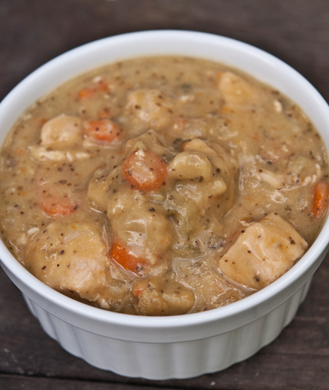 Chicken and dumplings, usually high in calories, carbs, and sodium, are no longer your diet’s worst nightmare. The classic comfort dish gets reinvented in this healthy recipe, which uses plenty of nourishing veggies for the stew and whole-wheat pastry flour for the chewy dumplings. One delicious 145-calorie serving will keep you feeling full for hours. Pour the broth into your crock pot (or into a large soup pot if cooking on a stove top). Add the marjoram and garlic powder to the broth and turn the crock pot to high (stove top, bring to a slow boil). In a pan, combine the olive oil, onion, carrots, and celery. Saute until the onions are translucent. Add the veggies and cut up chicken to the crock pot (or soup pot). In a large mixing bowl, combine the flour, baking soda, and salt. Whisk to blend well. Pour in the oil and milk and mix with a wooden spoon. (Be sure the broth is hot before adding the dumplings to the pot.) Using two teaspoons, scoop up and round off your dumplings and scrap into your pot. If using stove top, boil until the dumplings and chicken are cooked. If using crock pot, cook on high for about 3-1/2 hours. But if you need to cook it longer because you are leaving for the day (or cooking overnight), turn the crock pot to low and cook until the dumplings and chicken are cooked through. (about 6-8 hours). It’s important to know how your crock pot cooks here. Every crock pot is slightly different. Also, the dumplings will look a little odd after they have been cooking at the top of the stew all day. They create a sort of “crust-like” cover. Just break them up with a wooden spoon and stir them into the stew to finish cooking. Simply break one open to be sure it’s cooked all the way through.